Some of us have a hard time understanding why birds collide into windows, but it's not their fault, and it's not because they are "stupid," but because birds perceive things differently than humans. Sometimes they see their reflections and think it is a threatening intruder who they have to attack. Other times, because of their sensitivity to polarized light, they may not see the glass. 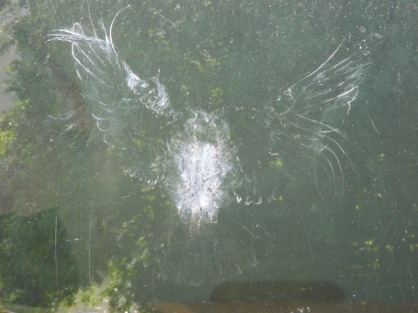 Whatever the case, window collisions are a real problem for birds. To prevent collisions you can stick things on your windows, or buy clear decals. But window collisions are not always fatal. A lot of times birds are just stunned and need time to gather their wits before they fly off. If you find a bird that is stunned like this DO NOT handle the bird unless it is necessary. When is it necessary? 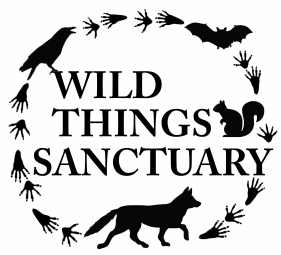 If there are predators about, such as raptors, or dogs & cats. Take all pets inside, and/or place the bird somewhere outside where it will be safe and protected until it is recovered and can fly off on its own. If the bird has its beak open and/or is breathing out of its mouth, this is a sign that the bird is in shock and should be put in a quiet, dark place ASAP and left alone in a quiet place until it calms down. 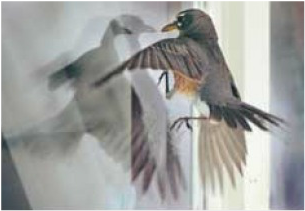 If you are concerned that the bird hit really hard, and it it has been disorientated for more than 30 minutes after hitting a window, call a rehabiliator. Often a severe concussion can result in brain swelling that is fatal a day or more after the initial accident. This can be prevented by treatment with anti-inflammatory medications by a vet or rehabilitator.